Today’s Gospel is Luke’s version of the call of St. Matthew. It brings to mind Caravaggio’s Renaissance masterpiece of Matthew sitting at a table, counting coins with four others in a dark room. Jesus and St. Peter stand at the right. 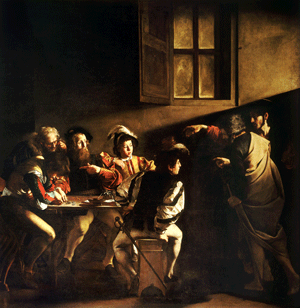 Jesus’ long finger points at Matthew, who looks up, his hand pointing to himself as if to ask, “Who, me?” A brilliant light streams from behind Jesus into the darkness. It’s a freeze-frame moment, a moment of decision. Everything seems to stop. The finger of Jesus is reminiscent of the finger of God, reaching out toward Adam, as we see in Michelangelo’s fresco on the ceiling of the Sistine Chapel. Christ brings light into the dark space of the sitting tax collectors. Their daily life is interrupted by the miraculous. God calls each one of us in mysterious ways—especially in the ordinary circumstances of our lives. Our calls are not as dramatic as Matthew’s. But for us too, during these Lenten days, the finger of God beckons us to follow him. He invites us to look at him, drop the stuff of this world, and follow his call to repent and believe his Good News. As it was for Matthew, the choice is ours.